Crystal Shimoon's volunteer work at the Whitehorse hospital is nothing complicated, she says. "It's pretty straightforward. You just knock on [a patient's] door and say 'good morning,' and ask if they'd like a cup of coffee or tea," Shimoon said. "It's a little bit like cold-calling. It's going room to room. You don't know who necessarily you're going to get." Shimoon is the co-ordinator of volunteer services and patient support for the Yukon Hospital Corporation. 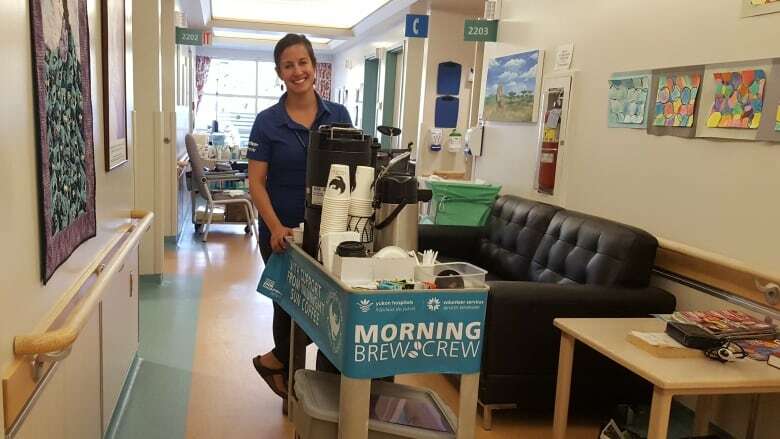 She's also part of the hospital's new, volunteer "Morning Brew Crew." 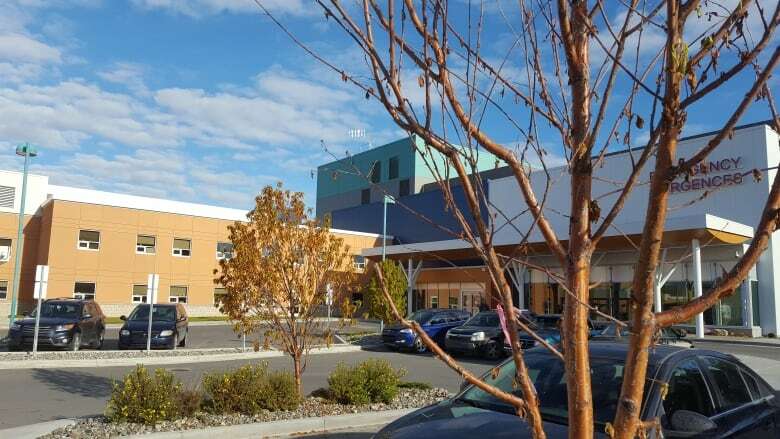 The volunteering program is relatively new to the Whitehorse hospital. It started about two years ago, and Shimoon said, so far, it's been a big success. There are about 60 regular volunteers, and the hospital is currently looking for more. They don't just serve coffee and tea, Shimoon said. 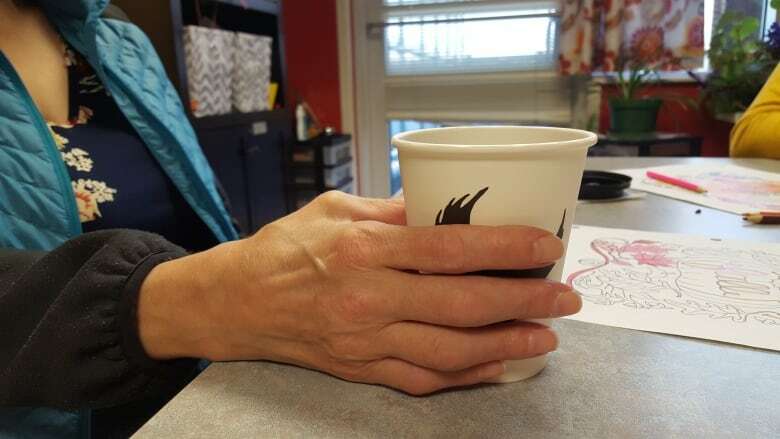 There's a volunteer First Nations cultural support worker, and people who help out in the emergency waiting room and at the hospital's information desk. "I try and tailor-make everything, you know, the experience — depending on what the volunteer is looking for," Shimoon said. "You don't need to be over-the-top social to do it. All different personalities do this," she said, wheeling the Brew Crew cart on to the next room. Volunteers are not doing the jobs of health-care workers, though. Shimoon said the volunteers focus on things hospital staff can't. "I know that every nurse, every doctor ... [wants] to be able to take the time to connect with patients, but the reality is they don't always have that time," Shimoon said. "That's where volunteers come in — filling in the social gaps." Doing the morning rounds with the coffee cart can take anywhere from an hour and a half to two hours — depending on how chatty people are, said Shimoon. "People really like having someone come by and say: 'Hello. Good morning. How are you doing?'" she said. "Because when you're in the hospital, so often it's all the medical staff that are coming to see you and doing everything that they need to do. But it's nice to have someone who's not interested in that side of things." It's amazing to see how much that "chit-chat" can mean, said Shimoon. Some patients are far from their communities, and some have no family or friends coming to visit them. "It might just be one moment for you as a volunteer coming in, one hour or two hours of your day. But for them, that interaction will make their whole day, and maybe even their week."